The rumors tucked away in the Sand Hills of central Nebraska hold more truth than told. Deep in this picturesque valley of cedars, sand and lofty hills, is a sought after secret of the mystical Merriam’s turkey. Plenty of the country hunted wasopen, but the birds have a propensity to find and use available cover to their advantage.The time-crazy world hasn’t changed the background of the old ranch town I stayed at. As I passed through the hundred yard main street strip of not-a-whole-lot, I soon became familiarized of what the little town was known for from the camouflage jackets and cowboy hats worn by the locals. I marveled at cattle ranchers stringing barbed-wire fence by hand for miles, while others admired their massive prairie burns. I felt as if I were taken back to the cowboy days and imagined the covered wagons trekking across the desolate land. Sod houses from the 1800’s still stood amongst the canyons and withheld their enduring beauty throughout years of erosion. Although, the scenery and generalization of the Sand Hills inspired my historic inner-feelings, I was there to conquer the last species of turkey for my Grand Slam quest and face the secrets head-to-head with Nebraska Hunting Company, a nationally acclaimed outfitter from the heart of Nebraska. 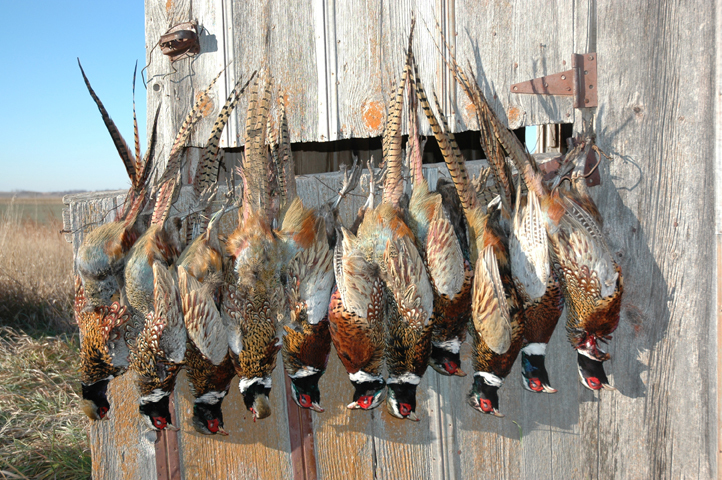 The owner and guide of Nebraska Hunting Company, Scott Croner, escorted me to one of his many morning setups. We fast-footed down a steep gully and them back up the other side to reach the peak of one of the thousand rolling hills. As I sat next to a cedar shrub anticipating the morning sunrise, the Merriam gobbler’s ignited the hills. The feud for dominance prolonged throughout the entire morning. Capturing each moment as it passed was nearly impossible. The crimson radiance of sun bloomed among the landscape, while turkeys began darkening the field to bask in the fresh heat. Hunter’s of all kinds couldn’t imagine the feelings I relished in as the sun accented miles upon miles of terrain with blushes of deep color. The Merriam’s wild turkey has been successfully stocked beyond its suspected natural range in the Rocky Mountains and outside of the mountains into Nebraska, Washington, California Oregon and other areas.I soon broke a light yelp rasp into the stiff Husker air. It boomed over the cast of fields with an echo of intensity. A parade of males answered with desperation. I yelped once more to seduce my lonely companions. They began gobbling to entice my will to come over, yet I played hard-to-get. The males nearly lost all sense of patience after five minutes of lockjaw from me. One-bye-one they began their voyage en route to the single yelp from my turkey call. As the gobbling maniacs shuffled their tubby bodies across the open terrain, Scott, my cameraman and I adjusted our positions to premeditate where the birds may come and visualize how perfect this may work. Unlike feeling engulfed by the timber of the Midwest while hunting, I felt nearly naked with only a small bush to conceal my Realtree HD camouflage. Being very still, I began calling once more to arouse my quarry with another gobble. Not only did they wail another electrifying gobble toward us, but they were nearly within BB range. Invariably, a surge of animosity enlivened my nerves and my body began to convulse in thrill. The gawky looking heads bobbed as they each looked at each other wondering if they’d made a wrong turn somewhere along the way. At 40 yards, the three pompous birds blossomed into a clutter of feathers. The strutters marched closer as the sandy dust blew behind each ones step. My cameraman urged me to shoot whenever I was ready. I acknowledged his command, but couldn’t help imagining if they’d get any closer; they did. “Nebraska turkey hunting has enriched my soul with a different style and technique of hunting.” — Brandon WikmanI milked the hunt out until the birds were at a whispering distance of 10 yards. As long as I was still, I knew my camo would hold its own. My index finger snapped the safety, which the birds heard. Each head was elongated, like a periscope. I could have sworn that dinosaurs were still living from the scaly rough legs and paint-ball splattered head of blues, whites and reds. The common alarm putts were sounded before my wad of ammo clobbered the bird I shot at. Looking into the camera like a fool, my words wouldn’t come out. I was literally speechless. My first Merriam’s gobbler sprawled a few steps away and a long awaited Grand Slam of the four different species of wild turkey turned me into a dumbfounded mute. Nebraska turkey hunting has enriched my soul with a different style and technique of hunting. The wondrous Sand Hills have allured my temptations to venture back to Nebraska and relive the secrets that were witnessed. The Sand Hills are as dry as your mouth feels after wadding seven saltines down your throat. The color green isn’t a common color at the beach, likewise the hills either. Therefore, wear camouflage that has been through the laundry a few dozen times to blend in with the lighter brows, dulls greens, and crisp yellows or simply wear Realtree’s Advantage Max-1 HD Open Terrain to stay concealed. 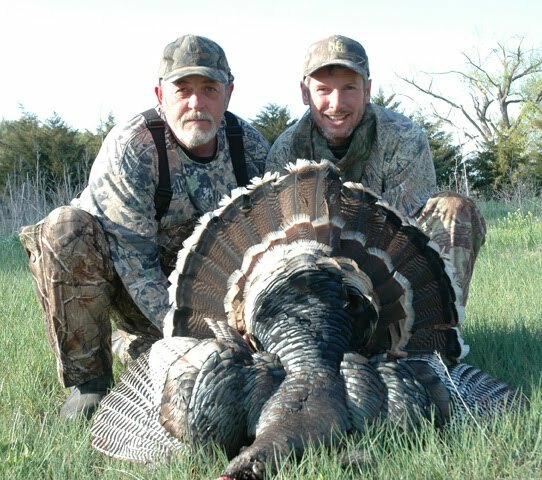 Most of Nebraska’s turkey hunting takes place on private land. Preseason scouting will help establish and renew landowner contacts — the first steps to a successful hunt.>>>Before slobbering on your mouth call to find a gobbler, locate a place you can sit down immediately. Small cedar tree’s dominate the landscape, which makes you vulnerable to the eyes of turkey’s for hundreds of yards and the last thing you’d want to happen is for a gobbler to crank up and start bolting towards you as your standing there finishing your series of yelps. >>>Never bypass a small woodlot, because looks can be very deceiving. The land is open and vast, and by noontime birds are looking for shaded places—canyons, windbreaks or any spot low and out of the sun. 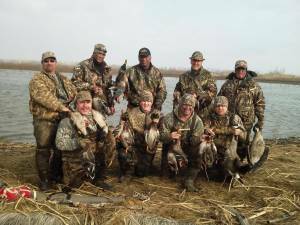 For more information on hunting Nebraska contact Scott Croner of Nebraska Hunting Company (402-304-1192) or (www.nebraskahunting.net) for turkey, waterfowl, upland bird, whitetail and mule deer hunting.